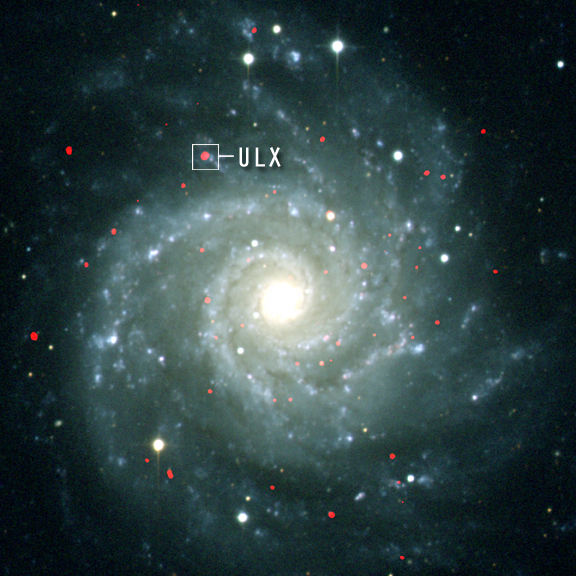 This composite X-ray (red)/optical (blue & white) image of the spiral galaxy M74 highlights an ultraluminous X-ray source (ULX) shown in the box. ULX sources are distinctive because they radiate 10 to 1000 times more X-ray power than neutron stars and stellar mass black holes. Chandra observations of this ULX have provided evidence that its X-radiation is produced by a disk of hot gas swirling around a black hole with a mass of about 10,000 Suns. The ULX exhibits strong, nearly periodic variations in its X-ray brightness every two hours. These variations are likely produced by changes in the hot gas disk around the black hole. The size of the disk is related to the mass of the black hole, so more massive black holes are expected to vary over longer periods. The observed two-hour variation suggests that this black hole has a mass of about 10,000 Suns, which would indicate that it belongs to a possible new class of black holes - intermediate mass black holes. These black holes have masses well above known stellar-mass black holes of about 10 solar masses, and well below the multimillion solar mass black holes in the centers of galaxies. How could intermediate mass black holes form? 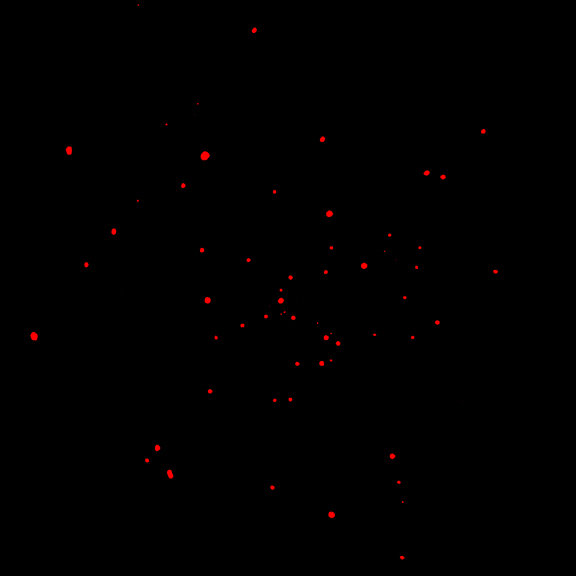 The leading theories under consideration are that they form as dozens or even hundreds of stellar-mass black holes merge in the center of a dense star cluster, or that they are the remnant nuclei of small galaxies that are in the process of being absorbed by a larger galaxy. Scale Image is 9 arcmin per side. Coordinates (J2000) RA 01h 36m 41.70s | Dec +15º 46' 59.0"